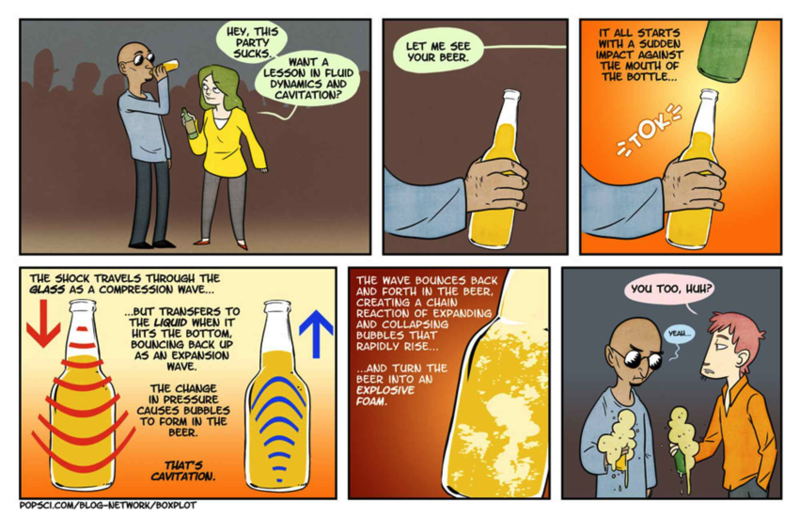 The Science Of Beer And Cavitation #SaturdayMorningCartoons « Adafruit Industries – Makers, hackers, artists, designers and engineers! What neither the perpetrator nor the mark are aware is that they have just demonstrated a phenomenon known as cavitation. When liquid, such as our beer, undergoes a rapid change in pressure, it spurs the formation of vapor cavities (hence the name) in low pressure areas. At the 66th Annual Meeting of the American Physical Society Division of Fluid Dynamics, researchers from the Carlos III University of Madrid, Spain and Universite Pierre et Marie Curie, Institut Jean le Rond d’Alembert, France demonstrated how this series of expansion-compression waves can cause the rapid degasification of beer. Even cooler is this video of cavitation being done in a beer bottle that only contains water!